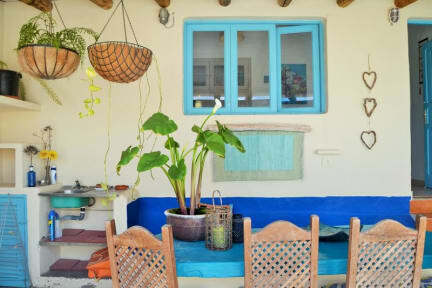 Go Rustic in Lanzarote and discover the hidden secrets of the north.....Our beautiful Casa and casitas are situated in the picturesque village of Tabayesco overlooking La Garita Beach, Arrieta. 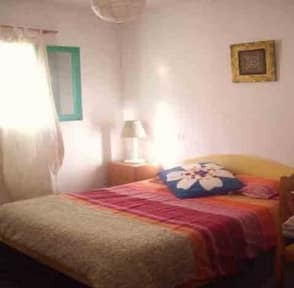 Our bright and cheery casa sleeps up to 8 persons with spacious living room area, fully equipped kitchen, two bathrooms and lovely Moroccan style garden for you to relax in! Each casita sleeps up to 4 persons with one (double room) and one room with (2 singles) kitchen, Living room with T.V; Bathroom, Great Roof top terrace.. with sunbeds etc...Perfect for chilling out and BBQs..Unbeatable sea and mountain views! If you are looking for the perfect getaway this is a great spot, where you can practice yoga or tai chi on the beach; or take advantage of some spa and massage treatments in nearby Costa Teguise . Or if that's not your scene...maybe pick up a surfboard and catch a few waves along the beautiful coastline! Arrieta is also famous for hosting some of the top fish restaurants on the island, where you can relax with a glass of our local wine Bermejo whilst watching the local fishermen arriving with their fresh catch of the day! For sporting enthusiasts with a different approach to the island, we are in the perfect location for cyclists, surfers, scuba divers and hikers! This area has some fantastic routes through the valley or some more relaxing ones along the coastline.